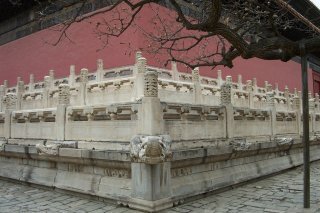 The Imperial Tombs of the Ming and Qing Dynasties are examples of funerary architecture built on the principles of feng shui. The Ming Tombs comprise two distinct burial sites: Xiaoling Tomb of the First Emperor and the tombs of 13 other emperors of the Ming Dynasty. Xiaoling Tomb lies in Nanjing, the others at the foot of Tianshou Mountain, north of Beijing. 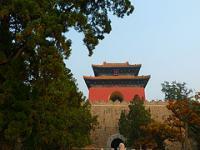 I visited the Ming Tombs on a daytour with a Chinese group. The trip, every day available for 50 yuan at the Qianmen busstop, also took us to the Wall at Badaling. For the tombs we stopped at Changling and Dingling. Changling consists of three courtyards. It's a fine place to walk around. At Dingling, also known as the Underground Palace, you can go .. underground. About seven meters below the ground there is a series of large, hollow rooms. Here the coffin of Emperor Wanli was found, together with two of his Empresses. 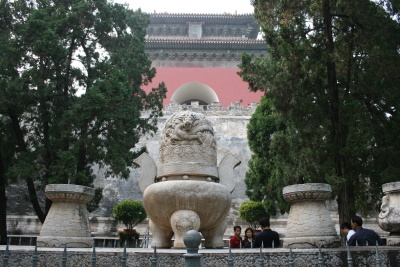 Because of the tour, I didn't have the opportunity to see the Great Palace Gate or the Avenue of Stone figures. My guidebooks reccomend those, to see it you have to go there on your own (by taxi for example). I have been to all open parts of this WHS in last 5 years. 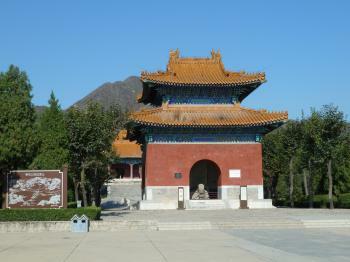 The best of these mausoleums was Qingdongling, Hebei province, Then the Ming tombs in Beijing. The best single tomb was MingXianling in Hubei. Beijing's Ming tombs have some highlights, first was the hall of Changling, second was the underground palace of Dingling, but almost all the treasures was destroyed in Culture revolution. I visited this WHS in October 2013. I was one of the few visitors early in the morning at the Changling Ming Tomb. The highlight of my visit was the fact that the wooden structures rafters and decorations were still in great condition. My time in Beijing was limited and so I decided to go for the first of the imperial tombs (Changling) instead of the underground imperial palace. Nearby Changling there is also the sacred way to visit at an extra cost. This WHS all in all was not too bad, however it is not Beijing's best and it will almost always be compared to the nearby Great Wall which many visit on the same day. Like others I visited the Changling Tomb. I visited China the first time in 2006, and at the time I was not even aware of Unesco. I enjoyed my time at the tombs, while I was not rushed, I did feel there was so much more to explore. It turned out I was right, when later I re-visited my pictures concerning the Ming Tombs, I realized I visited only one part of a huge complex of tombs. 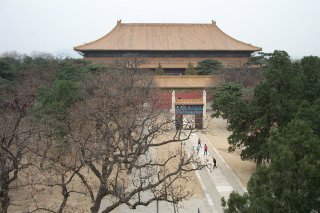 In the future I would like to make plans to visit some of the Ming Tombs around Nanjing. Particularly, after visiting so much of the Joseon tombs, it would be fascinating to explore more of the Ming sites in depth. When I visited the Changling Tomb it was one of my first days in China, and I was pretty much "going along for the ride". I had little to do with the planning and everything was so new and interesting to me, my senses were on overdrive. It was also one of my first intertnational experiences. Now after much more experience in Asia, I would love to visit China a 3rd time and explore the country based on my own itinerary. Well this is the best review I can give. It is based on the 15 minutes during which I was given a dull tour of a few reconstructed buildings. From speaking to other later this seems to be the general experience of visiting this complex on the combined 'Ming Tombs and Great Wall' tours offered from Beijing. I managed to see about 5 buildings and caught glimpses of some stone statues and that was about it. We spent about 5 minutes looking at some plastic food set out like a royal feast, there was a dummy of an Emperor then we were whisked out. I later found out this was the Changling tomb which seems to be the highlight of the area. Our tour guide seemed genuinely miffed that we wanted to see some more, and did sincerely seem to believe that we would spend our time better in the Pearl factory, Tea factory and Jade factory that took up more of the day trip than the actual sites. I know he was receiving commission at these factories but even factoring that in there was little regard shown for this site. If you have an actual interest in this site then try to get there under your own steam rather than as a stop on a Great Wall tour. As for me, I would have liked to have seen the spirit way but I don't think I will be rushing back, as from what I have read the mediocre offerings I saw actually were the highlights. Perhaps next time I am in this area I will head to some of the other tomb clusters to get a better feel for them. As for this trip the best I can say is that at least I have something to add to my category of 'Worst WHS visits'. Jiangsu Province, Nanjing. Traveled with two friends on 22nd November, 2008. 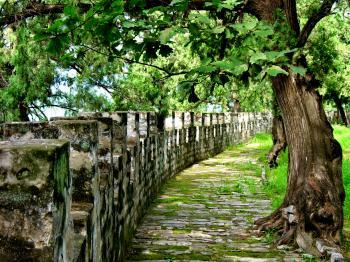 Ming Xiaoling Tombs is part of the whole Zijin Mountain scenic area. 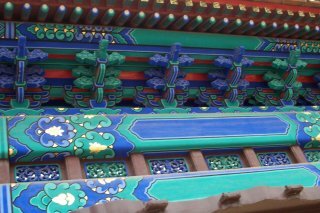 Package ticket of 140RMB per person gives access to Sun Yat-sen Mausoleum, Memorial Hall and the Ming Tombs. It is early winter, but the autumn leaves at this time are at their most brilliant. From Shanghai, Nanjing can be a quick weekend trip. Most of the tourist sites in China, such as the Ming tombs have concession tickets for the elderly over 65 or 70. Some places requires you to be 65, while some requires you to be 70 in order to qualify for 50% off the adult admission rate. If I remember correctly, the Ming Tombs offer 50% off for seniors above 65. Do remember to bring along your I.D. to prove your age. Overall, I think it was a nice place to visit, but it will get extremely crowded in the underground palace. There were many local chinese visitors and most of them were quite rude and pushy. Do beware of your personal belongings as the locals have a very bad habit of pushing their way through instead of saying "excuse me". There are 3 sites combined into this heritage. I visited 1 of them at Eastern Beijing called East Qing Imperial Tombs. A famous queen who was buried here. There had a myth about her tomb. She was buried with a large gem inside her mouth. Surprisingly, her corpse was mummified. However, a tomb thief stole the gem out and her corpse was turned into bone. The story seems not scientific but it would increase your interest to visit a site. The Ming Tomb in Nanjing, which is part of this site, is interesting but unspectacular. The burial mound itself has not been excavated and is only of passing interesting. Since its addition to the world heritage list the tomb's entry fee has been raised to 50 yuan. This is a rather exhorbitant figure considering the nature of the site. 288 Community Members have visited.